Because home testing blood glucose is new to many vets - and there are lots of vets who still refuse to use it - those vets do not necessarily understand curves. They have been taught in many cases that every dog's curve is a bowl-shape with the lowest blood sugar at 6 hours. That's it - all dogs do the same thing. Which, if you give it a couple of minutes of thought, you realize pretty quickly that all dogs doing the exact same thing with a medication doesn't really make sense. After all, does your body use food or medications or exercise exactly like everyone else on the planet? I've been involved with forums for canine diabetics for 7 years now and I have seen every kind of curve imaginable! Some dogs do the classic bowl. But even that can vary in how deep the "bowl" is. Most of them, unfortunately, do not have incredible level blood sugar throughout the day. So sometimes they can start at 450, drop to 80, and then rise back into the 400s. Some dogs do mountain-shaped curves, as our dog's curves were on the first insulin he was given. His lowest blood sugar was at meal time and then it just climbed and climbed and climbed, hit the top of the Alps, and plunged back down. I've even seen double-humped camel shapes with two peaks and two low points of blood sugar. It's a nice idea that we give insulin every 12 hours and it lasts exactly 12 hours... also doesn't make too much sense if you think about it from your own experiences. Some dogs get 8 hours (ours), some get 12-13 hours (Yay! ), and some get 14-16 hours from an injection. I understand why they teach a tidy little picture in vet school. But life is not a tidy little picture! And dogs don't read the books. So I view every diabetic dog as his or her own "book" and the best way to regulate your diabetic dog and give her the best life and the best blood sugar possible is to read her "book." That book is written in curves. When you know how high her blood sugar is going and you know how low her blood sugar is going and you know approximately when those highs and lows occur, THEN you will truly know what you need to know about changing her dose. The lowest blood sugar always has to control the insulin dose. That's a really important - and sometimes difficult - concept to get. But it's absolutely crucial. 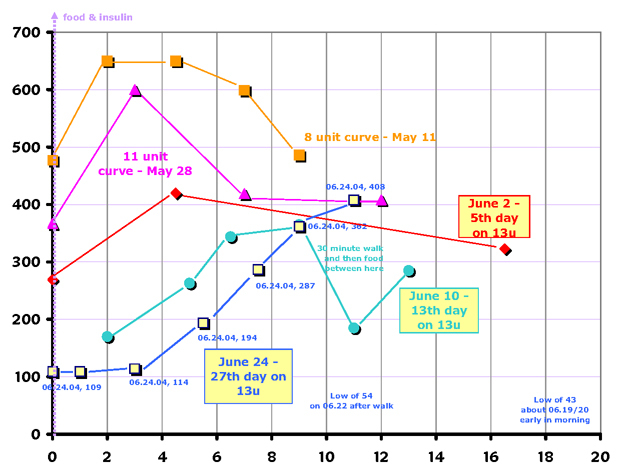 Because every time you increase the insulin dose, it isn't just the highest levels that come down. All of the levels come down. So if my dog's blood sugar starts at 450 and drops to 80 and then rises to 450 again, those 450s don't matter.... because if you give more insulin, the 450s won't be all that drops. The level of 80 will drop too. And I'm afraid that very little of this kind of information is transmitted to vets. Some pick it up on their own. Many don't. This kind of regulation is only starting to become standard practice for canine diabetics, transferred over from how people are regulated. Before home testing, a vet would often try to never let your dog's blood sugar get below 250... yes, below... because no one was testing it and they feared low blood sugar more than anything else. With some justification. Thanks to meters, we can do better. But only if we do the leg work - curves - to do it right.